Last night I went along as a +1 to Oxford Girl geek dinners, an event organised in order to encourage more women to get involved in technology. It’s an informal gathering with some presentations and lots of opportunity for networking. Men are permitted, but only if accompanied by a girl geek. 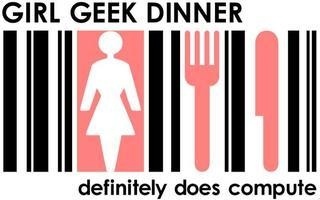 The Girl Geek Dinners were founded on the 16th August 2005 as a result of one girl geek who got annoyed and frustrated about being one of the only females attending technical events. She was tired of being assumed to be marketing, tired of constantly having to prove herself and decided that she just wanted a change and to be treated just the same as any other geek out there, gender and age aside. We started off at the White October offices with coffee and some presentations, before relocating to the Oxford Blue for some serious networking. Good fun and both myself and Kelly thoroughly enjoyed ourselves, more please! Last night we rocked Soundworks good and proper with the best Oxford Band Practice yet! Thanks to all of you who came along and gave it your all to make July’s meeting such a success! You were all without exception awesome, give yourself a huge round of applause – you all deserve it! To reiterate what I said at the end, we will have an August meet (date to be confirmed, but I’ll try and get a Thursday again). If you have any song requests then please get in contact, either comment here or go to our Facebook page. Below is a take of “Knocking on Heaven’s Door” which I managed to snap showing you all being awesome! Sorry for the shaky cam and if I if I didn’t catch some of you, next time I’ll stand in a better place!